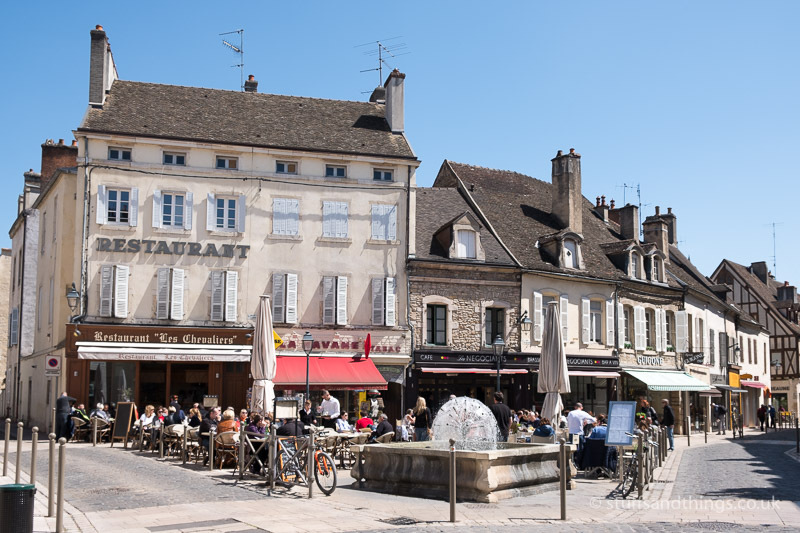 I love travelling in France, and had spent a couple of nights in Beaune last September, on my way home from a road trip to Monaco. That time I was alone, but it was such a lovely town I wanted to return with my girlfriend, so I booked a weekend break for us towards the end of April 2017. Note: the majority of photos in this blog were taken with a Fuji X-T20 and 18-55mm kit lens – an ideal camera for travel photography. We set off after work on Friday evening, and took the Eurotunnel to Calais. Our crossing was scheduled at 8.20pm, and after a few (not so unusual) delays we arrived in France at around 10pm local time. Our destination was Reims, where I’d booked a cheap hotel for the night. Reims is conveniently located around half-way between Calais and Beaune, so was an ideal place to stop for the night. After a good night sleep, shower and breakfast we set off again and were on the road by 9. 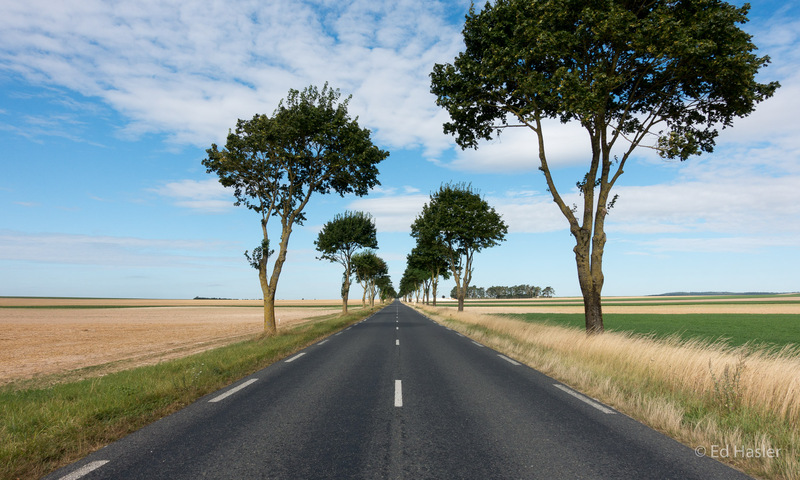 While there are some lovely roads through France, we stuck to the empty and fast Autoroutes to save time – although this did mean we had to pay around £40 in tolls. 3 hours of easy driving later, we arrived in Beaune and parked up outside the hotel. 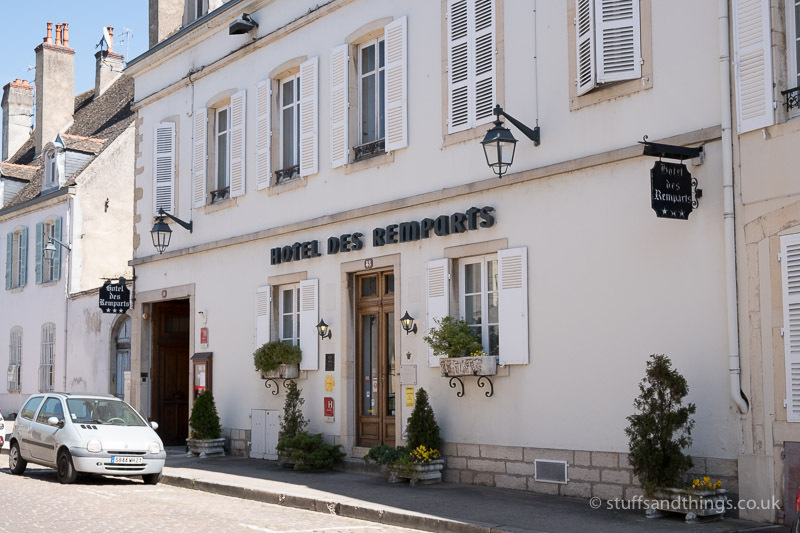 I’d chosen Hotel des Remparts as it was located in the centre of town, and also nearby to the wine producer where I had booked a wine tasting tour. Our room wasn’t quite ready, so they suggested we park the car in the underground carpark round the corner from the hotel. This was a bit of a mission, as the spaces are designed for very small French cars – and not my slightly larger Range Rover! Eventually I found a space I could fit into and still open my door, so we grabbed our bags and wandered back to the hotel. 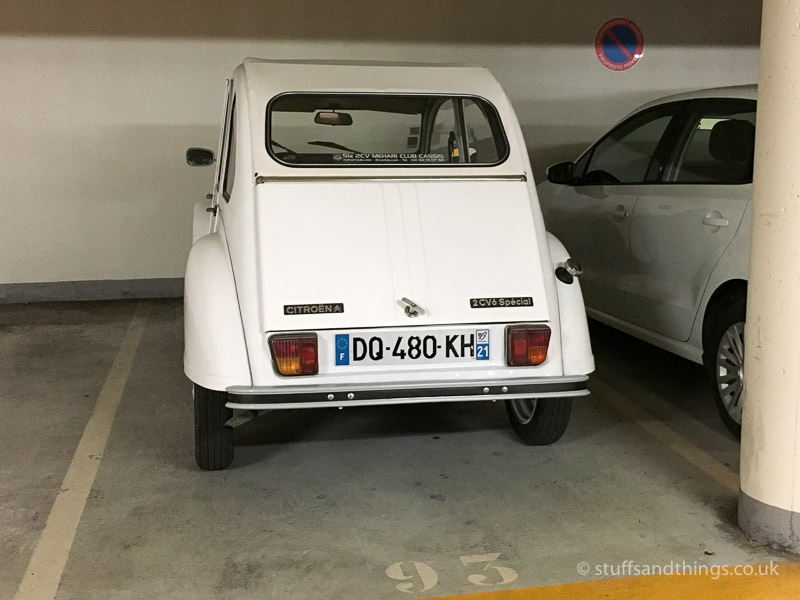 The parking spaces in Beaune were really only big enough for a Citroen 2CV! We’d spent so long trying to park that our room was now ready, so we dropped our bags in there and had a quick freshen-up. The room was lovely with lots of character, and there was a back door which faced onto the street behind the hotel. This made it very convenient to get in and out, so as soon as we were ready we wandered out again to explore. The hotel was very conveniently located, and it wasn’t long before we were in the centre and looking for somewhere to grab some lunch! 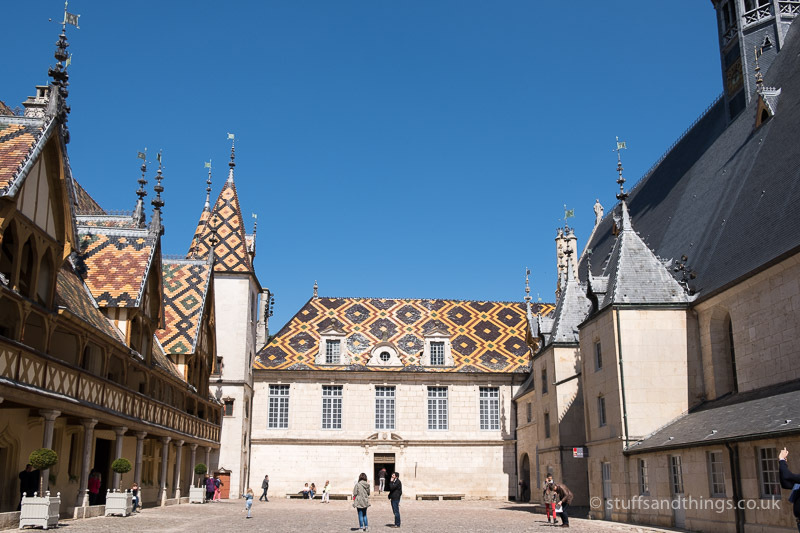 As I’d visited Beaune before, I knew roughly where to go, although it isn’t a big town so is quite easy to find your way around. A 5 minutes walk from the hotel got us to Rue Carnot, where we decided to grab lunch at one of the cafes. 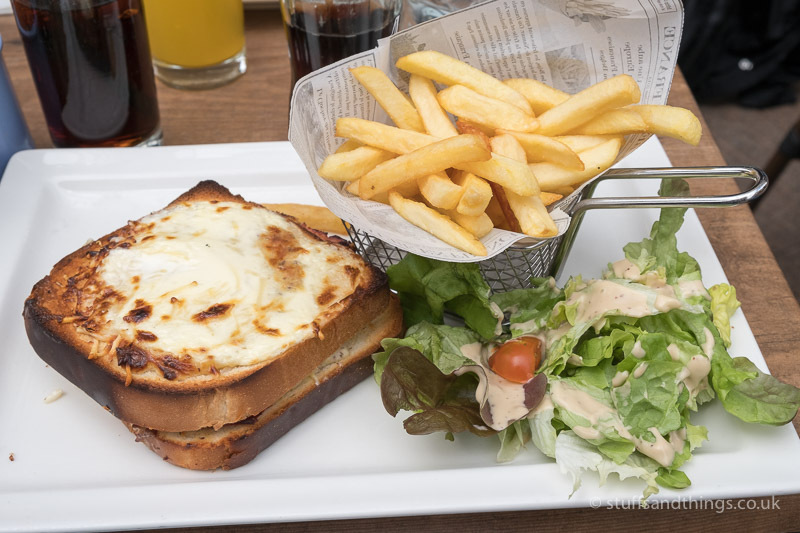 I didn’t fancy a particularly large lunch, so went for one of my favourite French snacks – a Croque Monsieur and fries! 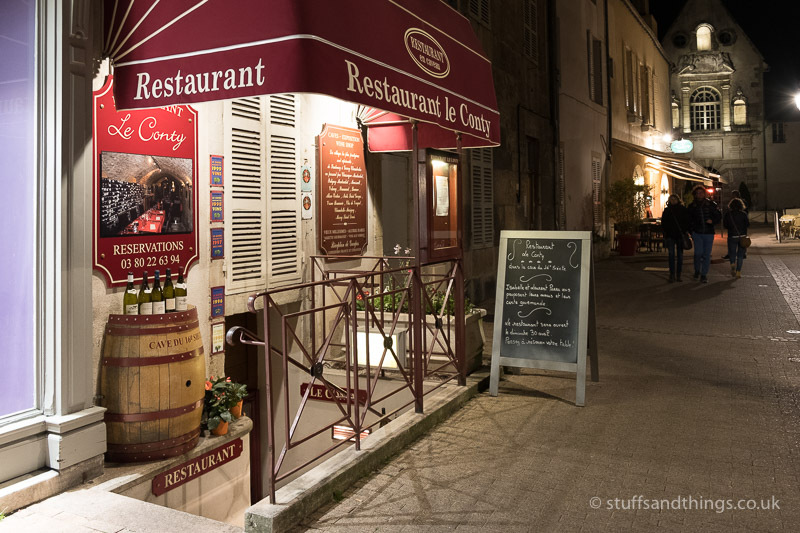 The food at Le Carnot was good, and I’d definitely recommend eating here if you visit Beaune. It was also lovely to be able to sit outside in the sun, and enjoy some warm weather. 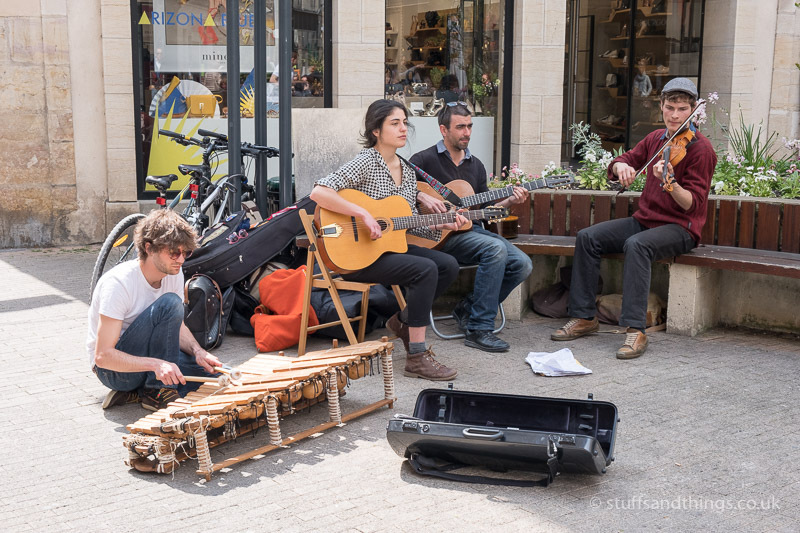 To add to the French cafe experience, there was a street band playing just behind us. Usually street bands can be quite annoying if you’re trying to eat, but this band wasn’t too intrusive and just added to the experience. After lunch, we went for a wander to explore some of the local shops. 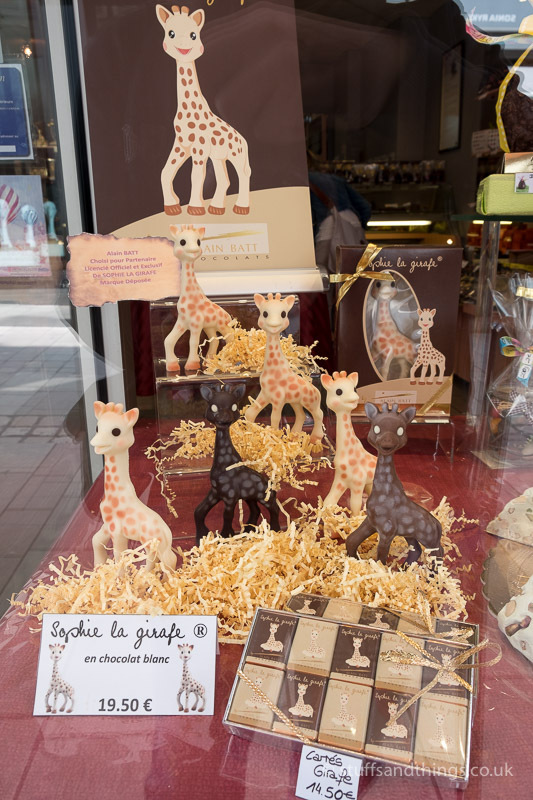 We discovered this chocolate shop that had a lovely selection of goodies for sale – including these amazing chocolate giraffes! These chocolate giraffes looked too good to eat! 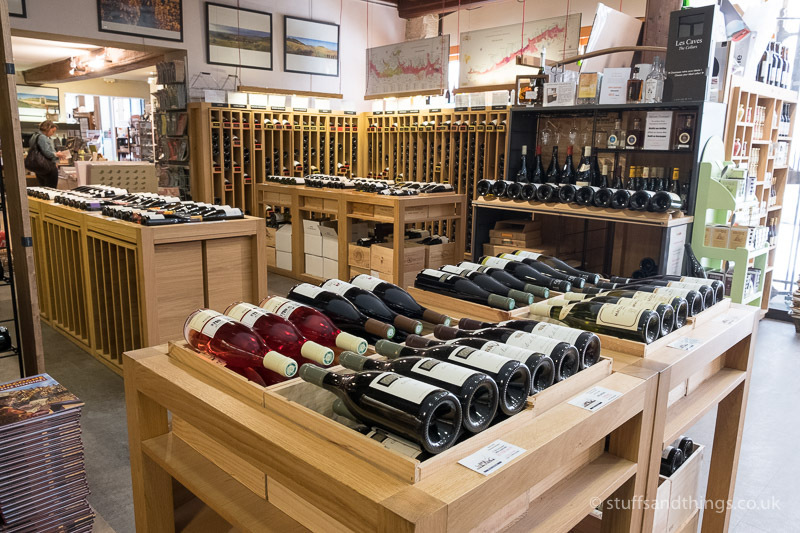 When I was in Beaune last year, I explored some of the wine shops, and there was one in particular that I wanted to return to. 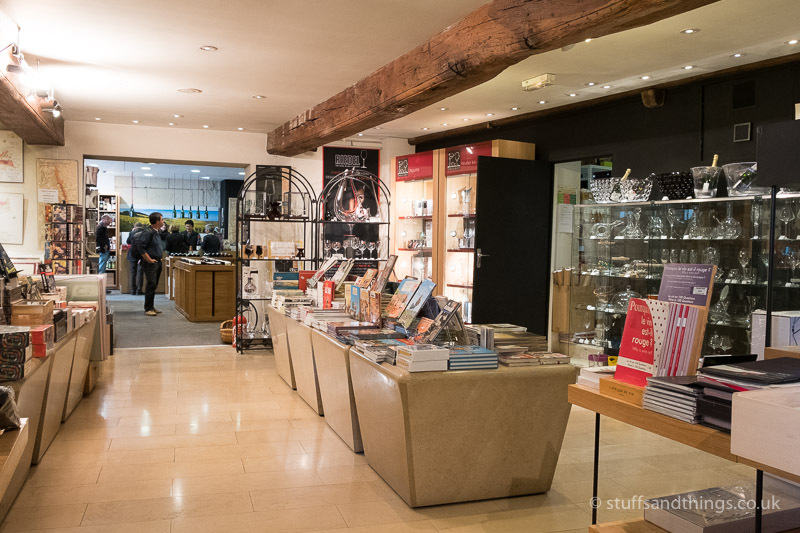 This was Athenaeum, which is an Aladdin’s Cave of wine accessories! 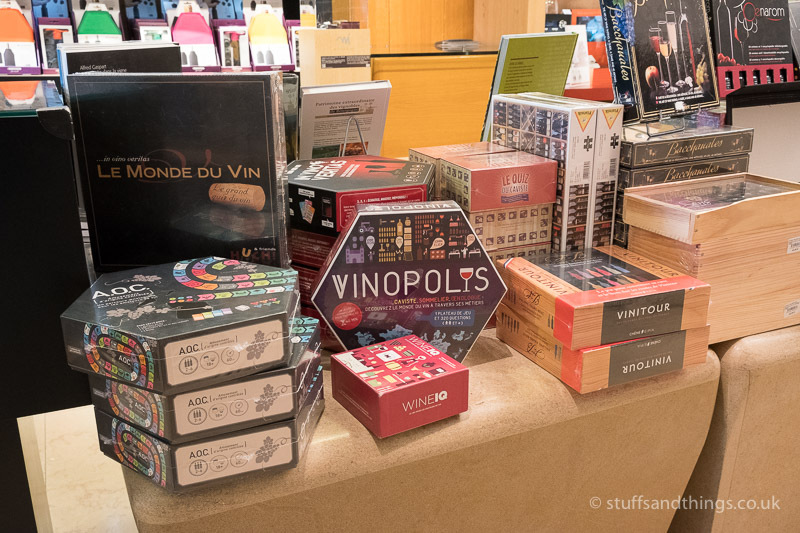 They sell everything wine-related including a large selection of cork screws, wine board games, decanters and a huge selection of wine books – plus anything else you can think of! Plus of course, a very large selection of high quality wine. 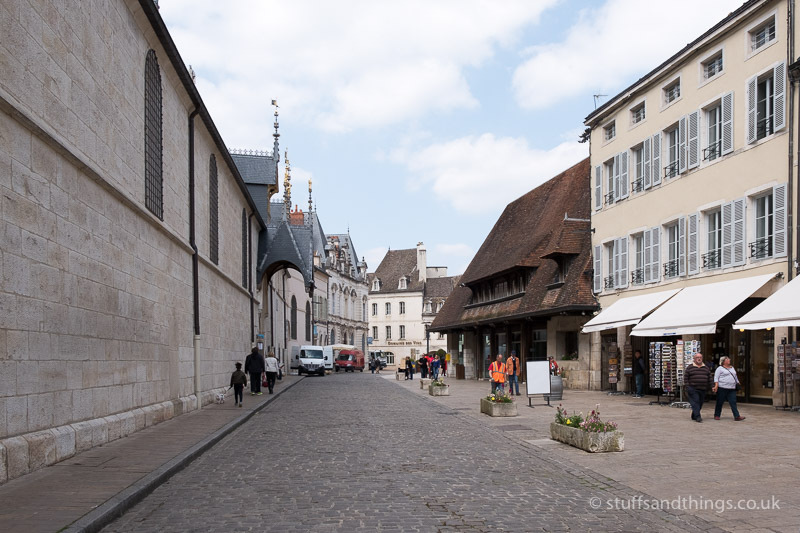 After a little bit of shopping, we ventured back outside onto one of the typical cobbled streets, next to the Hospices de Beaune (also known as l’Hôtel-Dieu de Beaune). 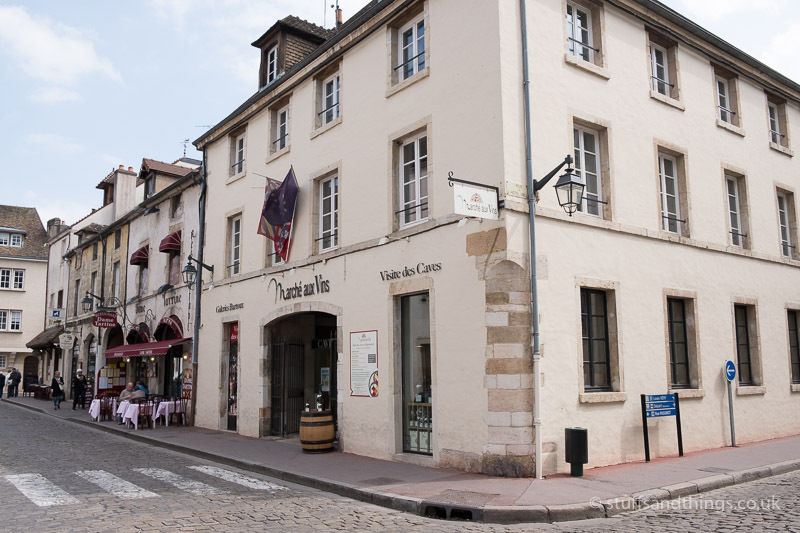 This was one of the many wine shops you can find in Beaune – many of them do tastings too. 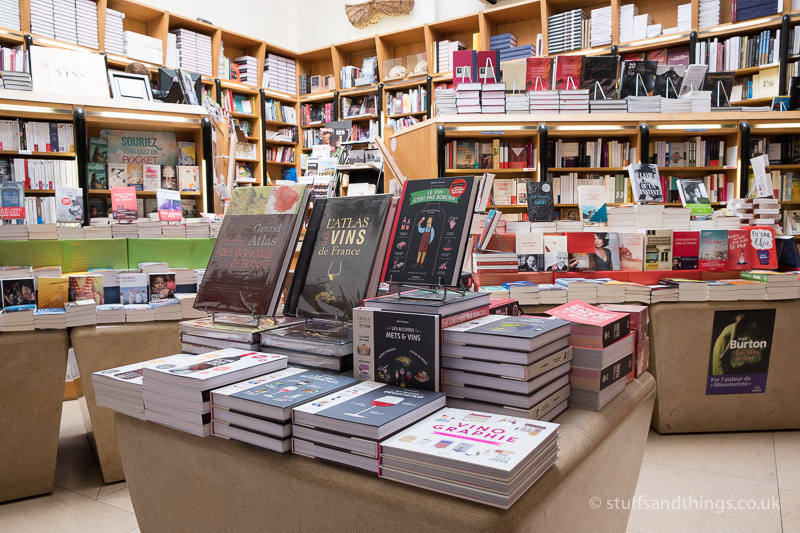 As well as lots of wine shops, there are also plenty of cafes and restaurants. You definitely won’t go hungry or thirsty in Beaune! The majority of these seemed to be situated to the side of Place Carnot, which is a little park area pretty much in the centre of Beaune. 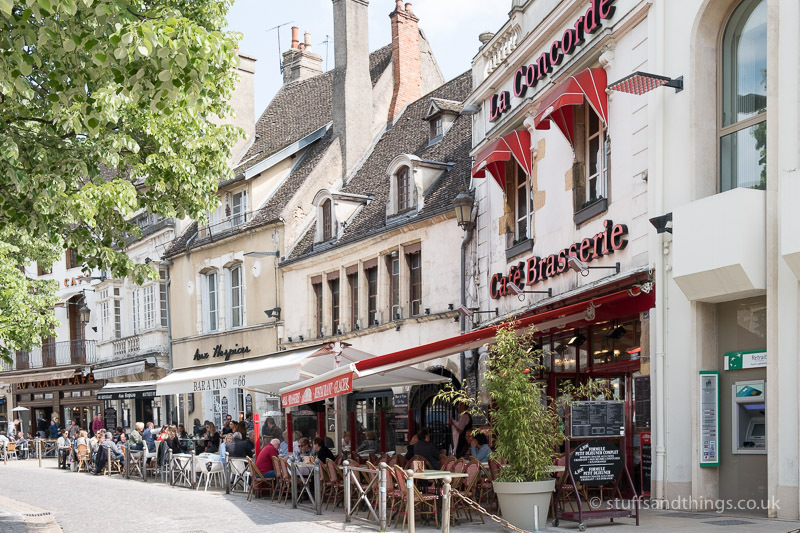 These cafes are a lovely place to eat or grab a glass of wine or a coffee, and watch the world go by. 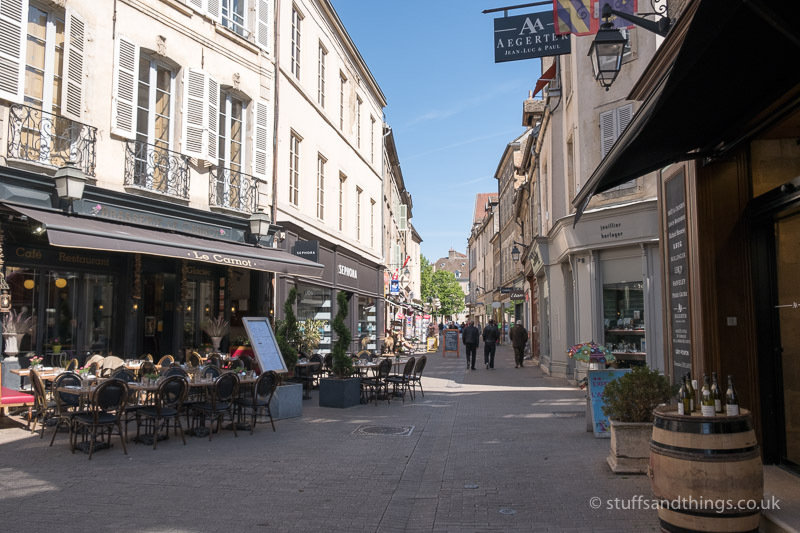 Unfortunately, we didn’t have time to indulge ourselves in a little street-side cafe, as I’d booked a wine-tasting tour at Bouchard Père et Fils for 3pm. We strolled up to the chateau, which was just past our hotel to the north of the town and arrived a few minutes early. While we waited for the tour guide, we had a look around the reception area, which had some interesting artefacts and some information about wine growing. 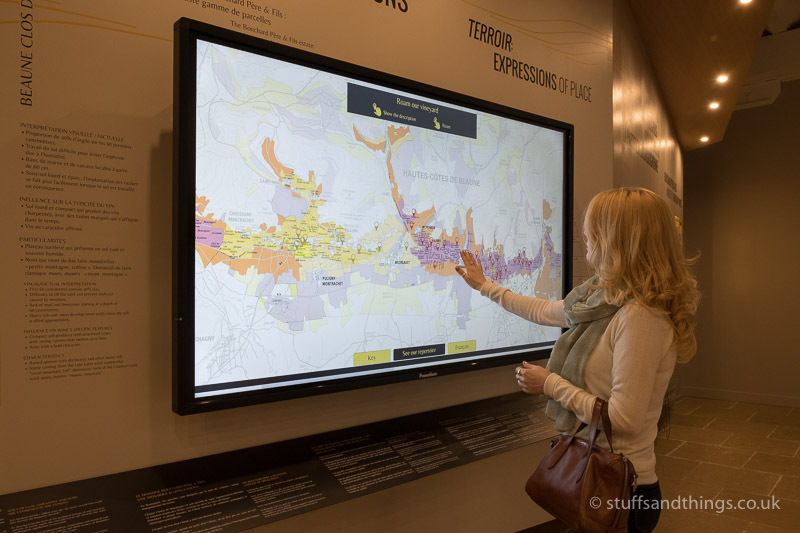 The large interactive map was particularly interesting! 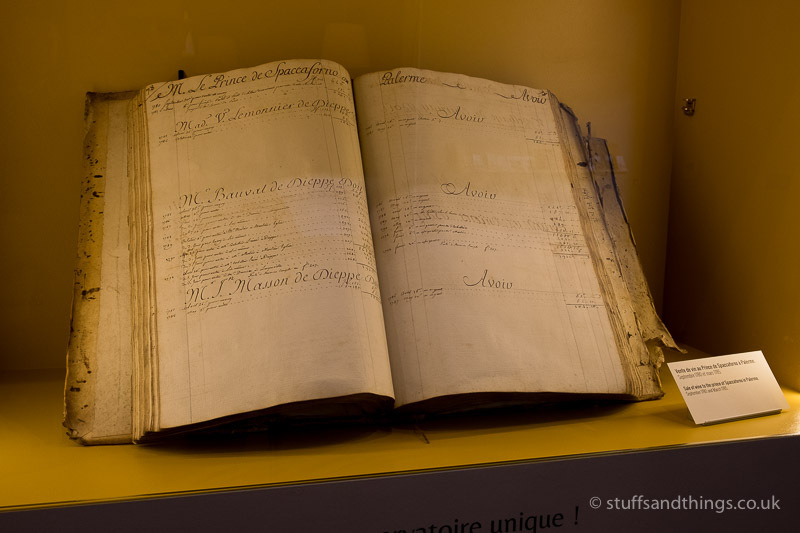 One of the artefacts on display was this old wine order book, which included the sale of wine to the Prince of Spaccaforno in Palermo, dated 1780! 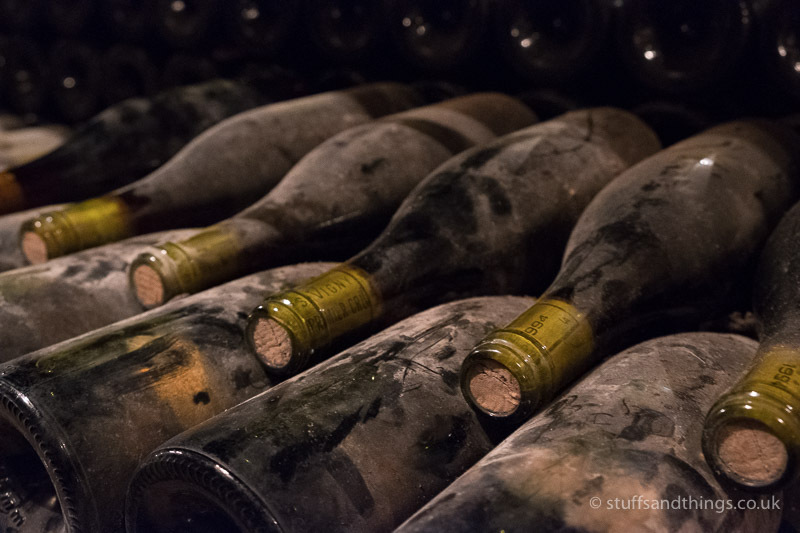 The tour began in a cellar under the main building – the Château de Beaune. This is a former royal fortress built in the 15th century by King Louis XI, and purchased by Bernard Bouchard in 1820. 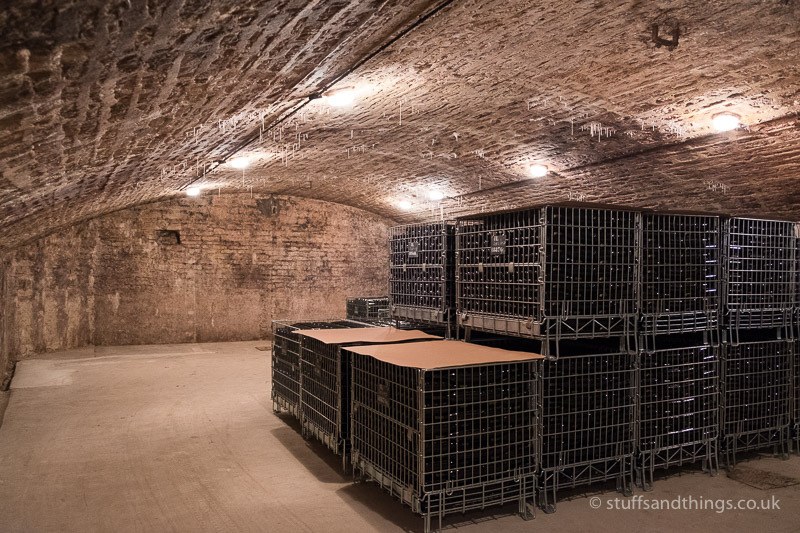 The cellars were originally occupied by the troops based there, but were found to provide perfect conditions for storing wine. 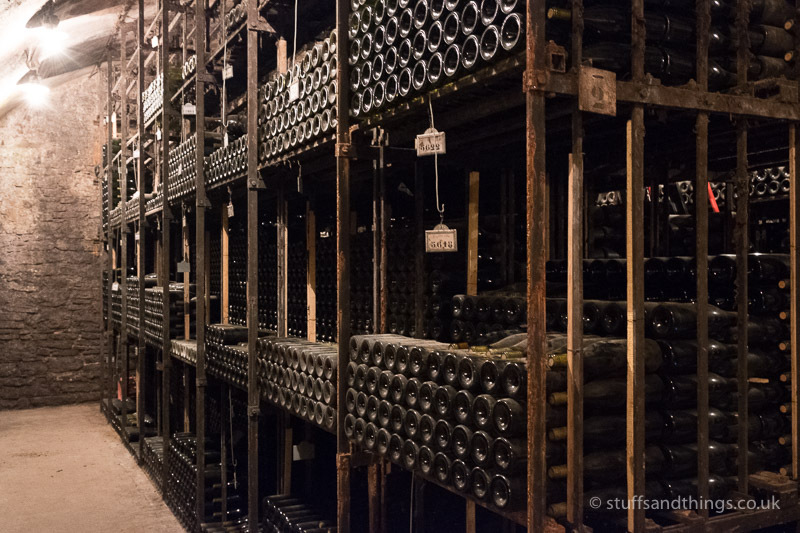 Some of the wine stored in the cellar dates back to the middle of the 19th century – these bottles were not quite that old, dating from 1994. 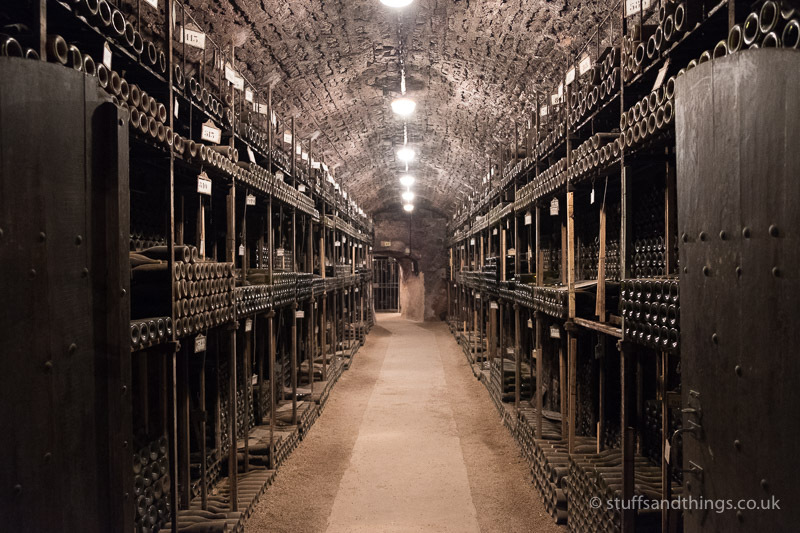 The cellars extend under the chateau grounds, and there are apparently 2.5 million bottles there – certainly enough to keep you going if you got locked in for a night or two! The wines are catalogued with white labels, and those with single digit numbers are the oldest – and apparently still drinkable. Many of the older wines are not for sale, but some do come up for auction occasionally – one such bottle sold for £30,000 recently! 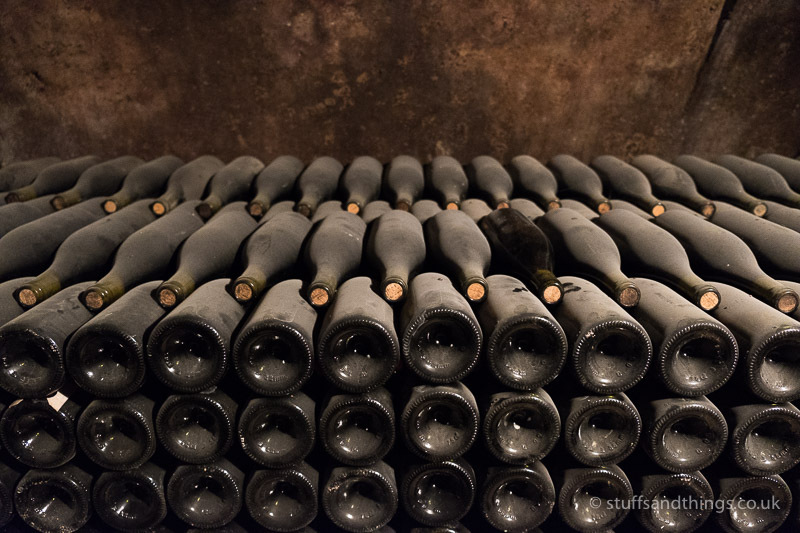 Not all the wine is that old though – they also store the latest vintages, and there were crates of 2015 vintage wine that had been bottled just a couple of months before, and will be available for sale later this year. After a fascinating tour through the cellars, we emerged from the middle of a large limestone rock in the beautiful grounds of the chateau. 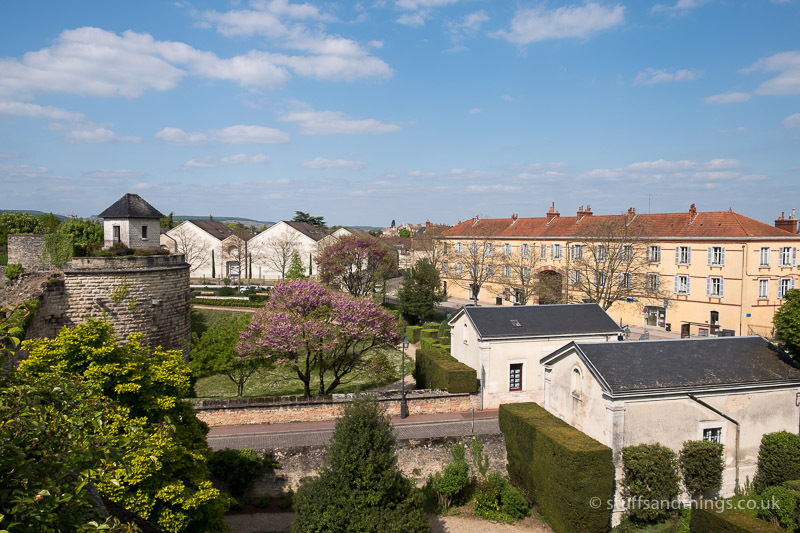 Climbing to the top of one of the remaining fortress towers, we had an excellent view of Beaune and the surrounding area – including some of the famous vineyards that are well known over the world. 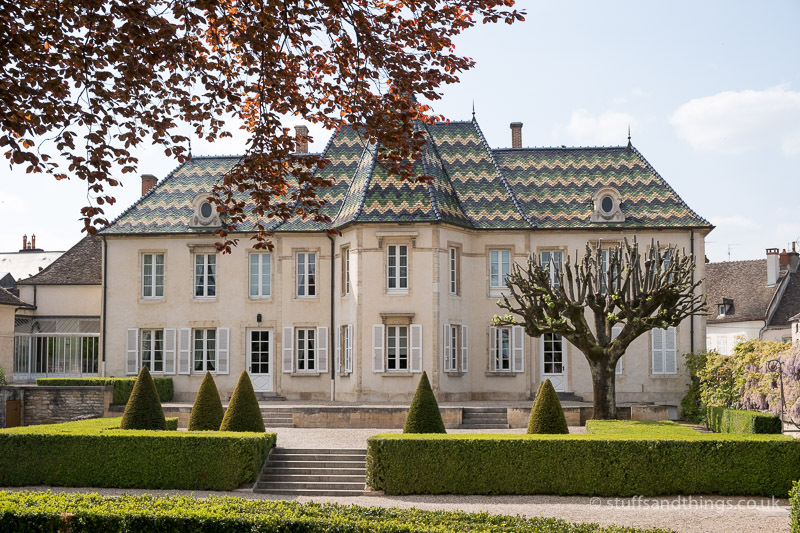 The chateau itself is stunning – and still in use as the weekend retreat for the current owners of Bouchard Père et Fils. After this fascinating tour, it was time to try some of the wines! 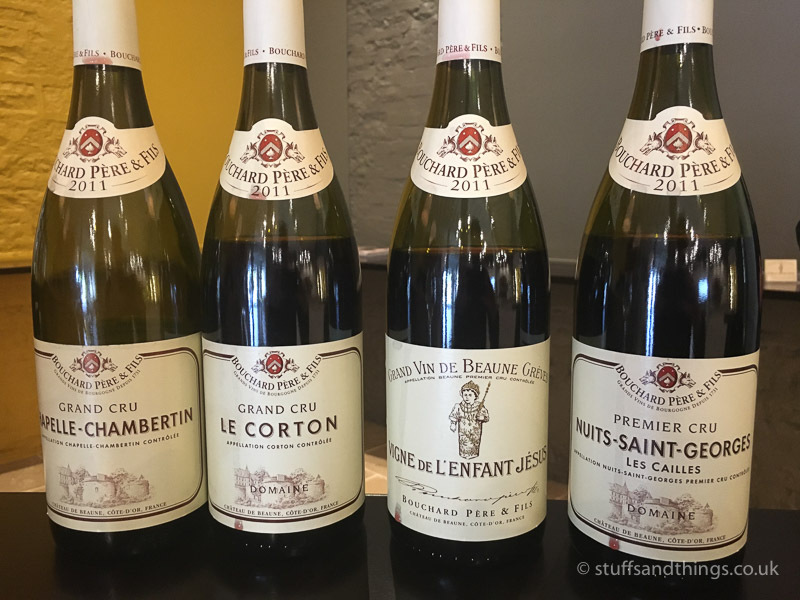 First up were some of the reds – including a couple of Grand Crus. Then we moved on to try the whites – which are regarded as some of the best white wines in the world. The tasting was very enjoyable, and it was interesting to taste the subtle differences in the wines, and find out more about each one. It wouldn’t be right to travel all the way to Beaune and not purchase any wine, so I ordered a few cases, and arranged to collect the following morning. By this time, evening was approaching, so we wandered back to the hotel and got ready for dinner. 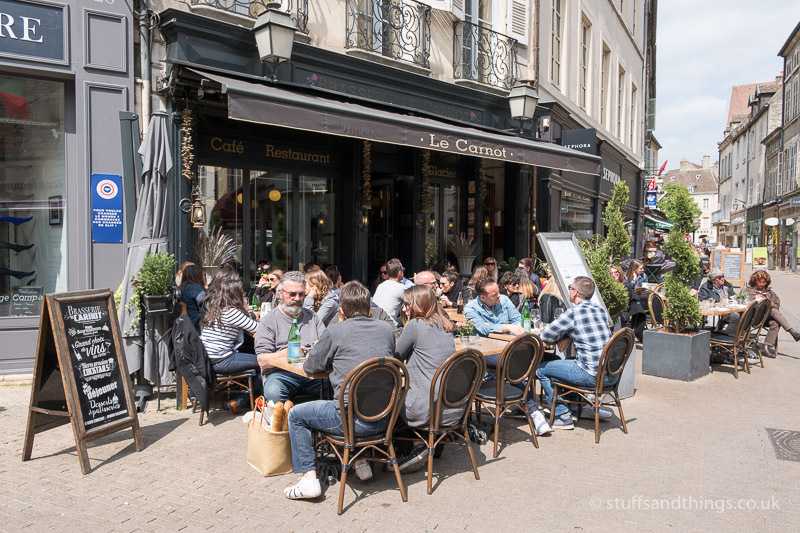 The hotel gave us some recommendations, and we decided to try one that was close to the hotel – a restaurant called Le Conty. 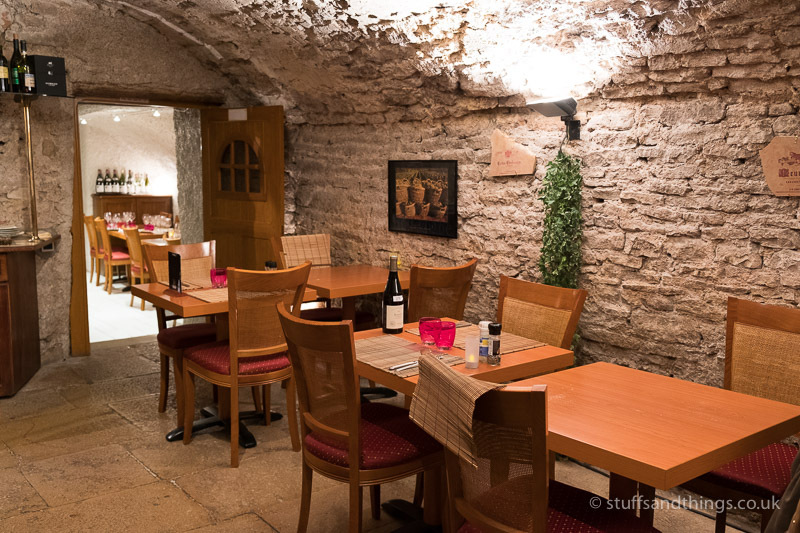 We ventured down the stairs into the underground part of restaurant, which was very cosy and romantic. 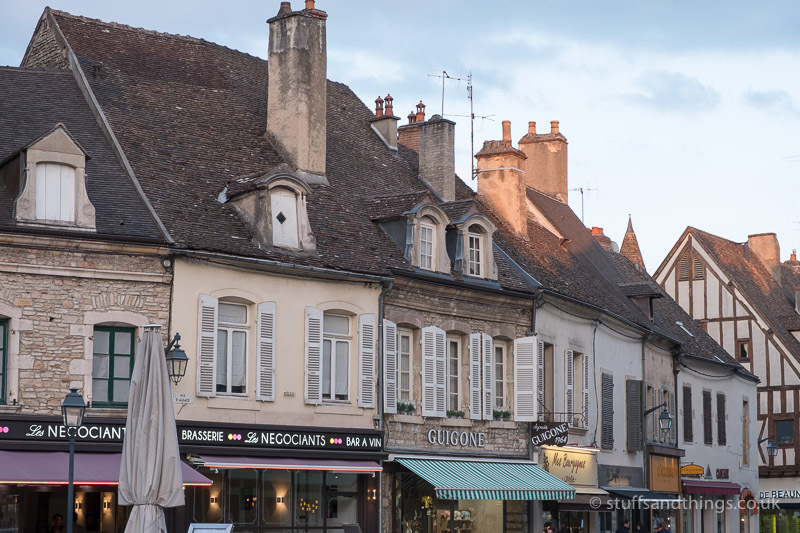 Being in Burgundy, there was really only one choice for dinner – and that was one of the local specialities – Beef Bourguignon, served with lovely soft bread to mop up the sauce! 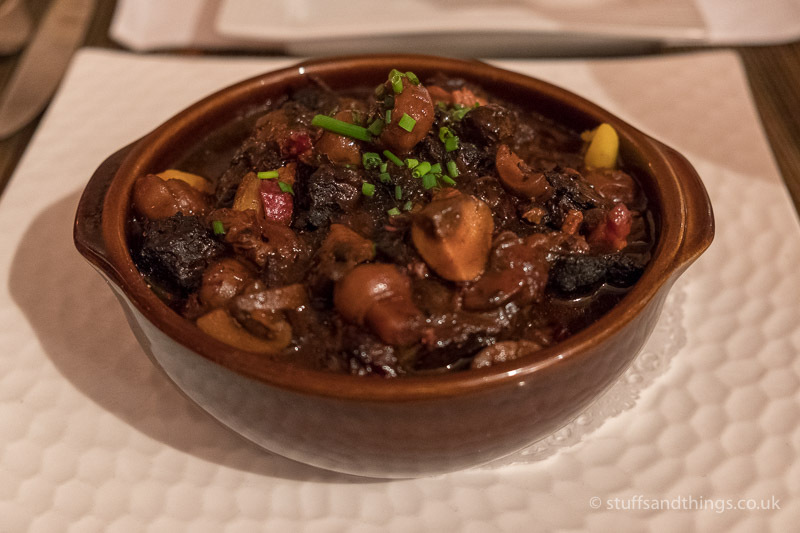 An authentic Beef Bourguignon – very tasty! The following morning, we drove up to Bouchard Père et Fils to collect the wine I’d purchased after our tasting, and left the car parked outside. As it was Sunday, the on-street parking was free – and there were lots of spaces available. We wandered back into town, and stopped off in one of the shops near Place au Beurre selling local produce. 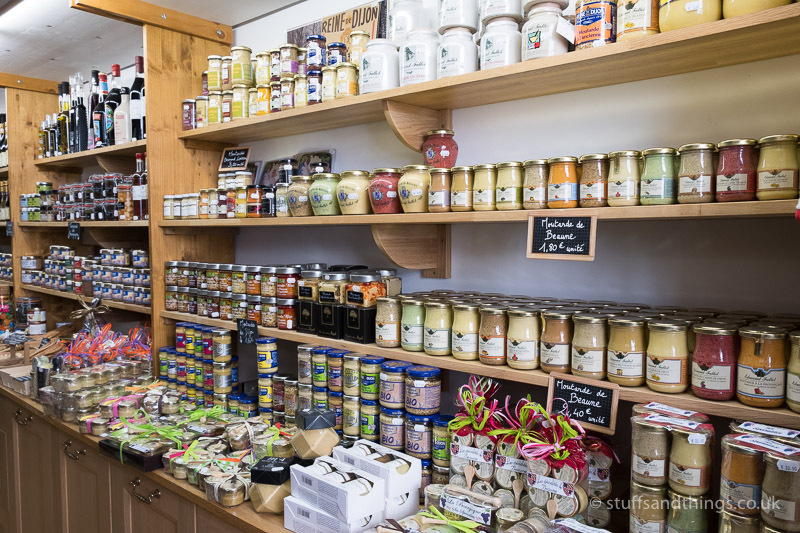 Nearby Dijon is well-known for its mustard, but there are plenty produced in Beaune too – and this shop seemed to have them all! 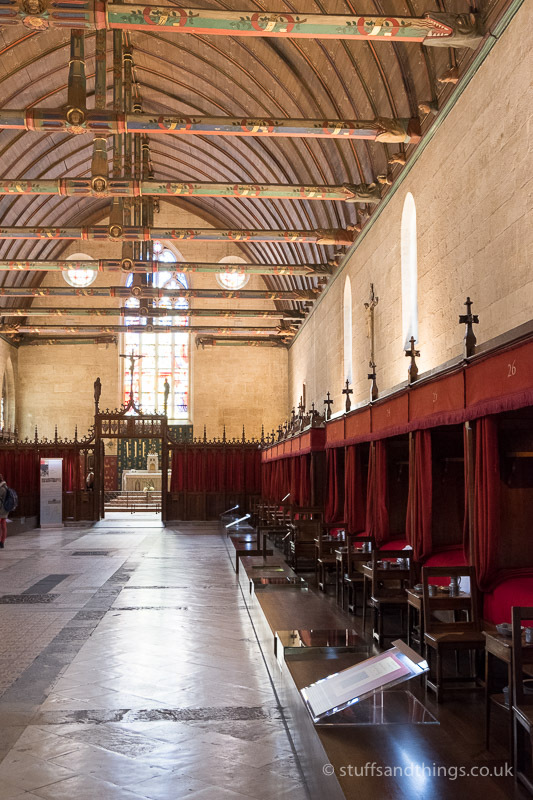 After a bit of shopping, we visited one of the most well-known buildings in Beaune – the Hospices de Beaune (also known as l’Hôtel-Dieu de Beaune). 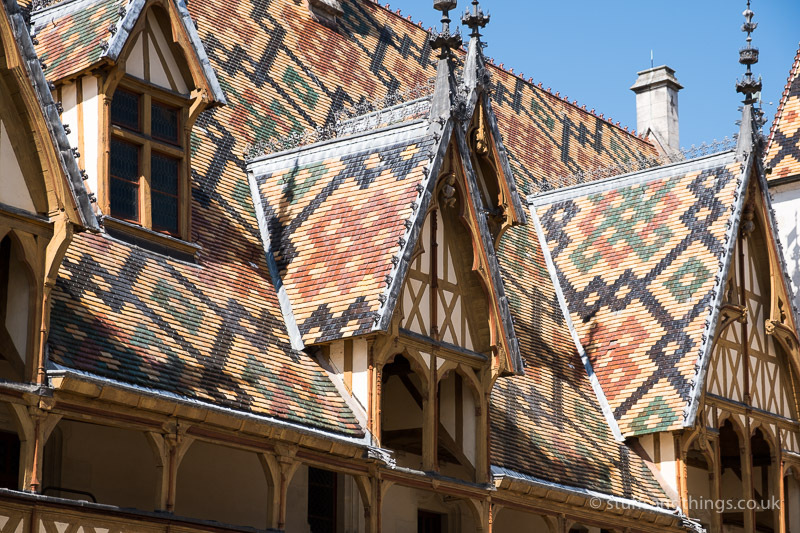 This was founded in 1443 by Nicolas Rolin, chancellor of Burgundy, as a hospital for the poor. The building consists of two main 2-story buildings around a cobbled courtyard. The most striking feature is the amazing glazed tiled roof, which is made up of patterns of different coloured tiles. One half of the building is a large hall called the Room of the Poor. 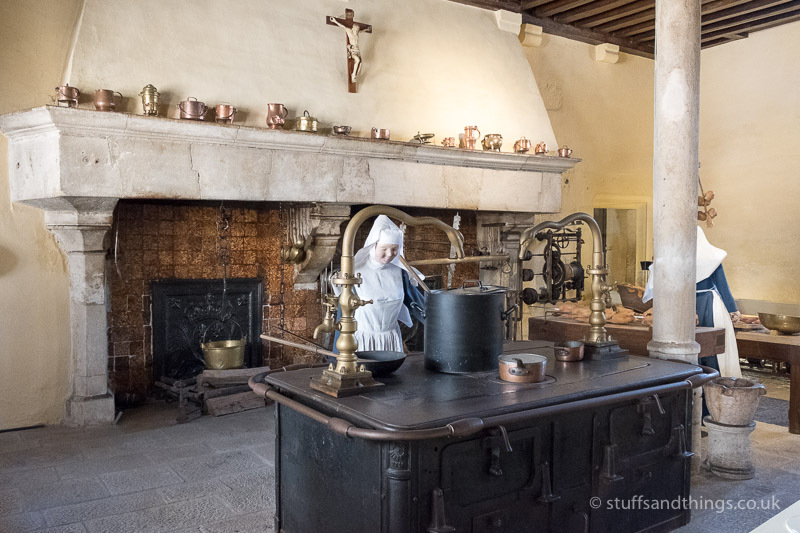 This was used as a hospital from as early as 1452, and contained 30 beds for the sick. As well as the beds, there was a chapel at the far end, and the roof was made from large beams with intricate carvings of beasts. 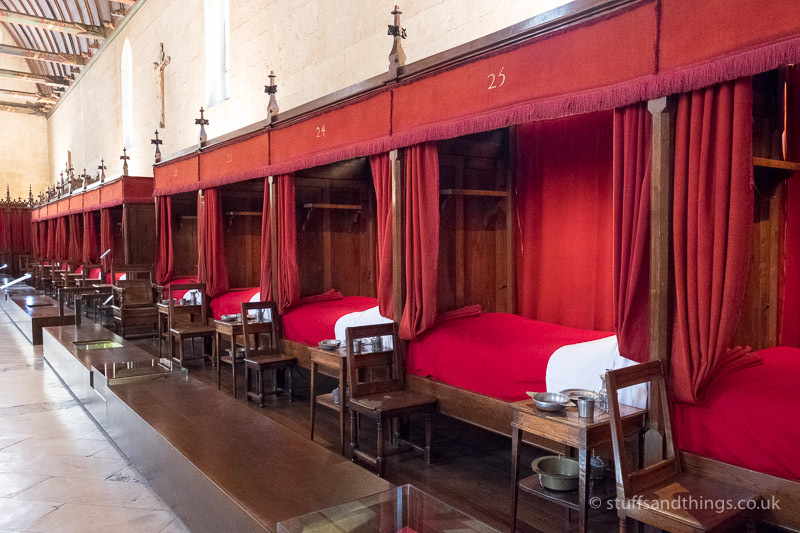 Each bed gave the patient privacy, and allowed the nuns to care for them. 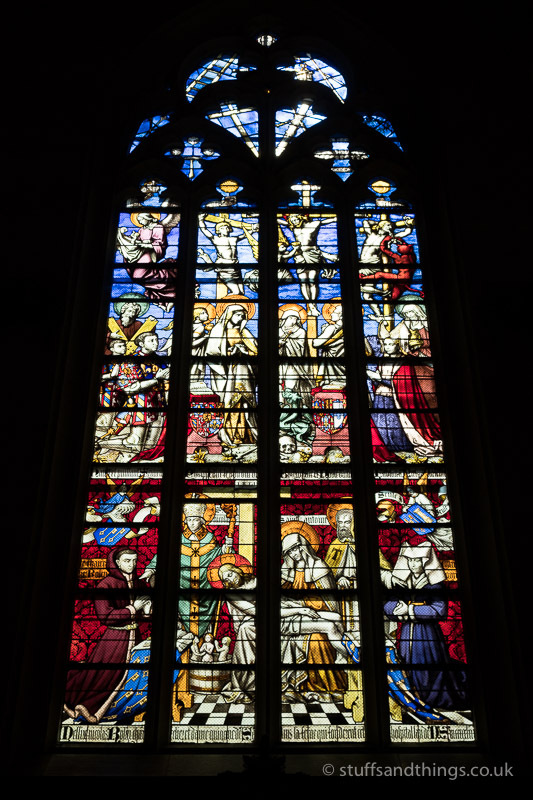 In the chapel, on the far wall, there is a large stained-glass window. The roof of the Room of the Poor is made from plain slate, in contrast to the very colourful tiles of the opposite side of the building. 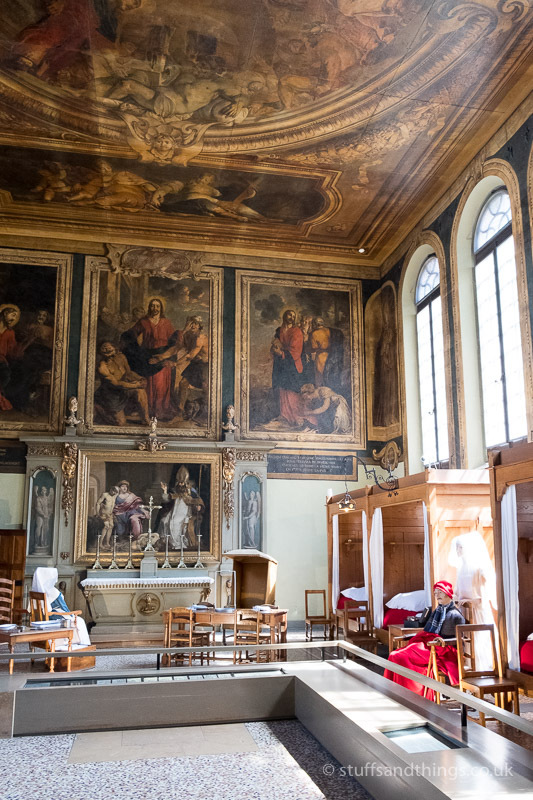 Other rooms of the hospital were not so plain – the painted ceiling here was especially impressive. As we wandered around the rest of the courtyard, you could see how the kitchen would have looked many years ago. 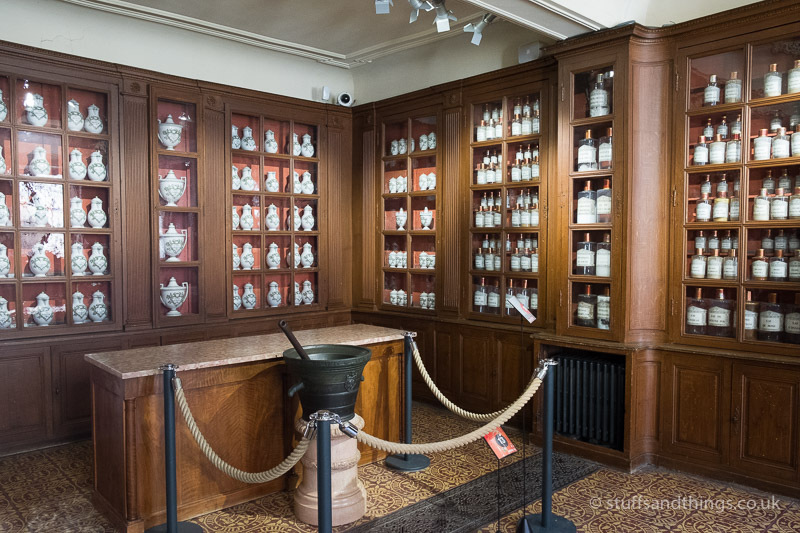 The old pharmacy was on display too. 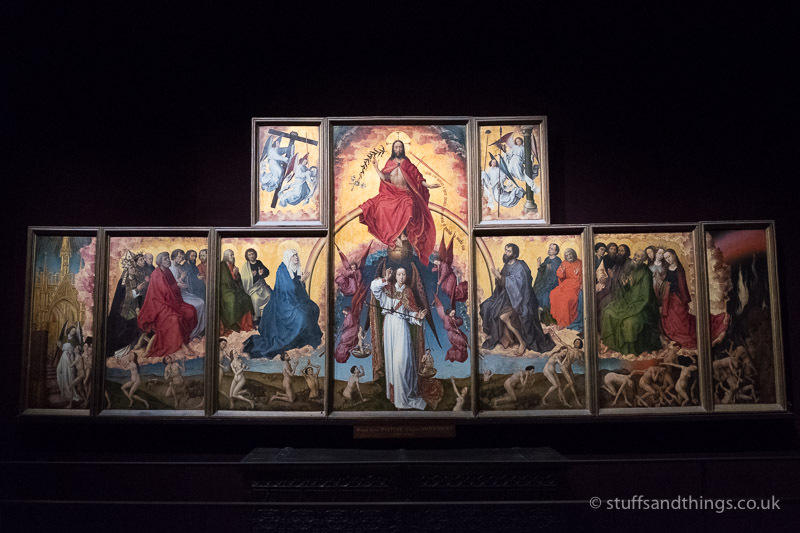 As we headed towards the exit, we stopped to look at the Alterpiece. This was painted oil on oak panels by the early Netherlandish artist Rogier van der Weyden, with some parts later transferred to canvas. It was commissioned in 1443, but is now kept in a darkened room to protect it from light in an effort to conserve it. After a brief visit to the souvenir shop, we ventured out into the streets again, and went to look for somewhere for lunch. We still had an hour or so before we needed to leave for the 5 hour drive back to Calais, so spend some more time wandering around and admiring the old buildings. I especially liked the roofline of the old buildings – each one seems to be a different shape and size, to give a wonderful random look. With the large selection of cafes, it wasn’t hard to find somewhere to grab lunch, and we ended up having a quick sandwich as neither of us fancied a big lunch. We spent the final minutes doing some last minute shopping, before walking back to the car, and heading north towards the Eurotunnel. 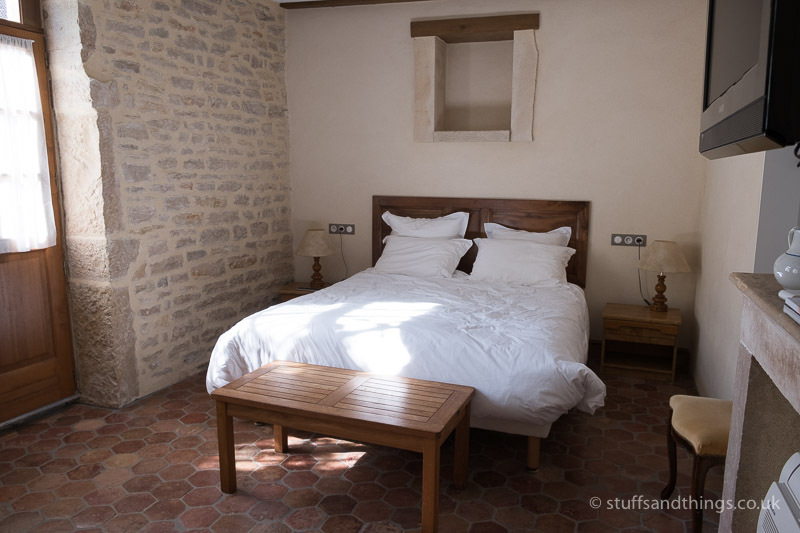 We’d spent just one night in Beaune, but had packed a lot in. 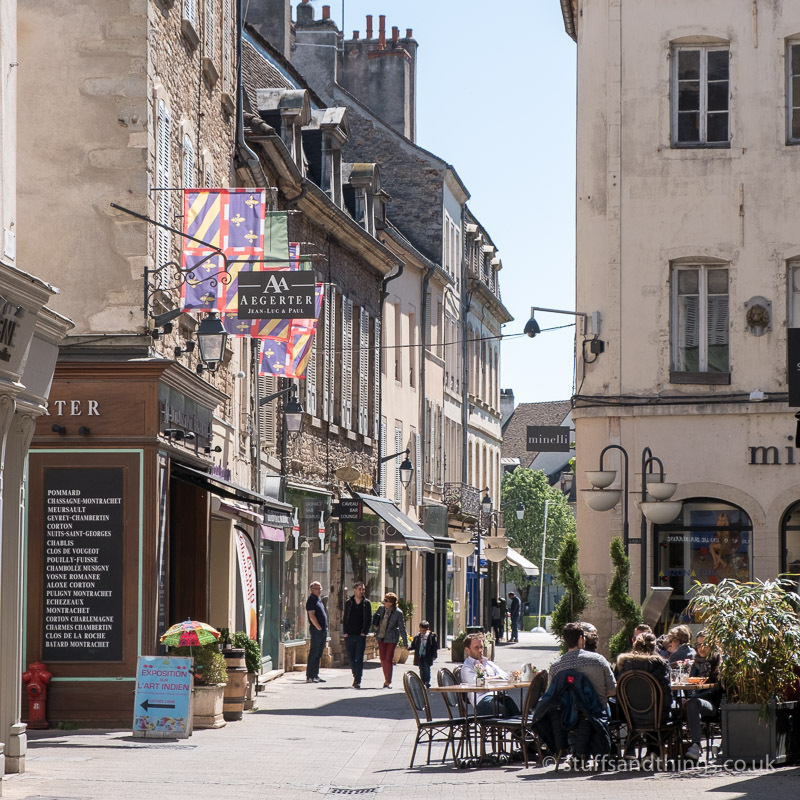 It is a lovely town, and I’d be happy to return – although next time I’d like to spend some time exploring the area around Beaune and some of the famous vineyards nearby. 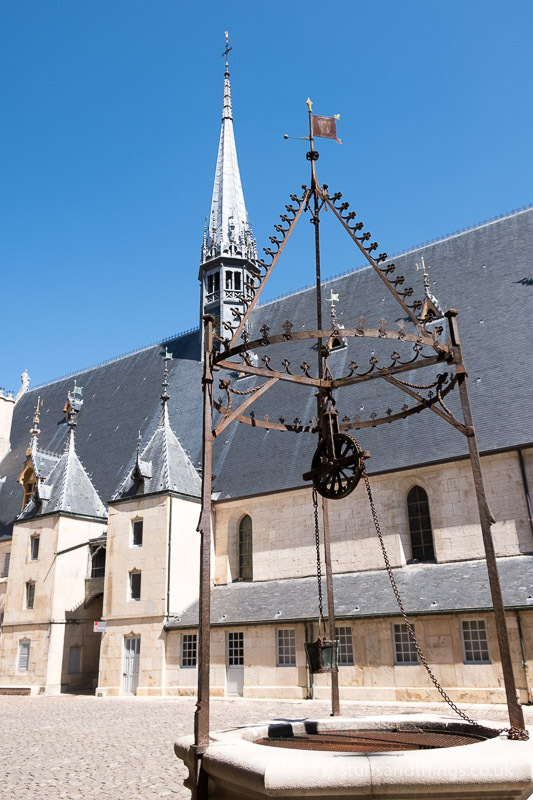 This is a very informative yet detailed blog about Beaune. The writer has told of his likes, and also of other parts which he would like to visit. Very well written. Hello, cool article :). 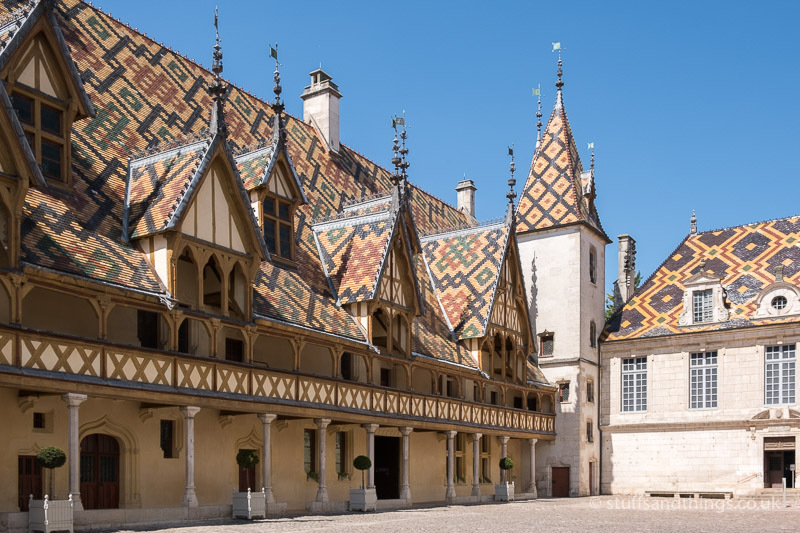 Made us want to visit Beaune soon. Thanks for the comments 🙂 I’d be happy to share – can you please credit me with a link back to my blog in return?